The Jed Luckless Band is back at the Bayou and the fellas deliver a deliciously spicy show full of Phish, Dead and fresh baked JLB originals! Second set opens with an “of the” medley, stringing together “Victim Of the Rhythm,” “Eyes of the world,” and “Valley of the Saints” with some nice jamming along the way. A rockin’ “Character Zero” follows, along with a nice new blues original from the band called “Far Gone Blues.” Things wrap up with “FM Rock,” an “El Paso” request from the crowd and a “Suzy Greenberg” finale. 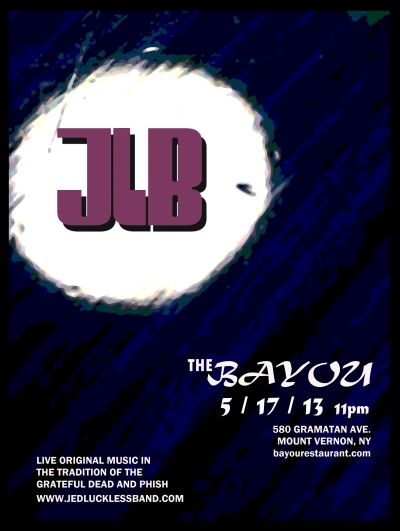 Another fun show at a venue the JLB clearly loves to play, surrounded by friends, friendly folks and fried chicken. Enjoy!